Rationale behind Infinity Foundation's HIST projects. Modern Western technology has produced amazing achievements, but we must analyze the wider implications of such technologies and their notions of progress. These technologies often bring huge negative consequences that seem negligible in the short-term. We need to dispassionately investigate whether there are alternative technologies that offer more sustainable progress for all, rather than only the privileged. In search for such technologies, traditional knowledge or �local knowledge' provides a pointer. Traditional knowledge is the technical, social, organizational and cultural collective memory of human responses to the complexities of life, and is a part of the great human experiment of survival and development. Western criteria should not be the sole benchmark by which non-Western cultural knowledge is evaluated. While Western intellectual discourse has marginalized the term 'traditional' with the connotation of 'pre-modern' in the sense of 'primitive' or 'outdated', many of the traditional sciences and technologies were quite advanced by �modern' standards as well as better adapted to unique local conditions and needs than their later substitutes. These traditional folk and elite sciences are intertwined with their distinct ancient cultures and worldviews. Unfortunately, modernization has homogenized the categories, reducing diversity of worldviews in ways similar to the destruction of biodiversity. Using contrived hegemonic categories � such as science verses magic, technology verses superstitions, modern versus tradition � European colonizers systematically exterminated or undermined local traditional science, technology and crafts. Aside from intellectual arrogance, there was a profit motive to this � as evidenced by Britain's conquest of Indian textile and metallurgical know-how. Many anthropologists who have recently worked with so-called 'primitive' peoples have been surprised to learn of some of their highly evolved and sophisticated technologies. The term 'Traditional Knowledge System' was thus coined as a scientific system which has its own validity, as a supplement to 'modern' science. Since the dawn of history, different peoples have contributed to different branches of science and technology, often through interactive contacts across cultures separated by large distances. This interactive influence is becoming clearer as the vast extent of pre-colonial global trade and cultural migration is being properly understood by researchers. However, one finds a mainly Eurocentric perspective in the teaching of the history of science. Typically, it starts with Greece, neglecting the influences of others upon Greece. Then it 'fast forwards' many centuries into 1500 CE to claim modern science as an exclusively European triumph, neglecting the influence of others (especially India) on the European Renaissance and the Enlightenment. The European Dark Ages are presumed to be dark worldwide, when, in fact, other regions saw innovation and prosperity. In fact, Europe was at the peripheries, until the conquest of America in 1492. With the entrenchment of colonialism, the contribution made by others, including India, was ignored. The British colonizers could never accept that Indians were highly civilized as far back as the third millennium BCE when the British were still in a barbarian stage. Such acknowledgment would destroy Europe's intellectual premise for colonization � its civilizing mission. Early British scholars documented Indian thought and its external manifestations as systems competing with their own and thus facilitated the transfer of technology into what became known as Britain's Industrial Revolution. What was found valuable was quickly appropriated and its Indian manufacturers were forced out of business, often through draconian laws enacted by the British. This was, in many instances, justified as civilizing them. Meanwhile, a new history of India was fabricated to ensure that generations of mentally colonized people would believe in the inherent inferiority of their own traditional knowledge. This has been called Macaulayism, named after Thomas Macaulay, the civil servant who became the most prominent champion of such British cultural imperialism strategy starting in the 1830s. When it became difficult for Europeans to ignore the massive archaeological evidence of classical Indian science and technology, they asserted that the Indus-Sarasvati Civilization had to be a transplant from the Egyptian and Mesopotamian civilizations. These constructions in historiography have been cumulative rather than re-constructive: more theoretical layers are constructed to explain new contradictory data rather than prior ones being re-examined or corrected. Unfortunately, despite Indian independence there has not been much effort at correcting these distortions. Many among India's intellectual elite continue to promote the notion that pre-colonial India was feudalistic, pre-rational, and, by implication, in need of being invaded for its own benefit. This has created a climate in which entrenched prejudice against non-Western knowledge persists. Even after independence, an institutional bias against traditional technologies continues. It is important to note that among all the conquered and colonized civilizations of the Old World, India is unique in the following respect: its wealth was industrial and created by its workers' ingenuity and labor. In the case of the Native Americans, the plunder by the colonizers was mainly of land, gold and other natural assets. In the case of the Africans, the plunder was both of natural assets and of slave labor. But in India's case, the colonizers had a windfall � extraordinary profit margins from the control of India's exports, the taxation of its economic production, and eventually the transfer of its technology and production to the colonizer's home. This comprised an immense transfer of wealth out of India to Europe. From being the world's major exporting economy (along with China), India was reduced to an importer of goods; from being the source of much of the economic capital that funded Britain's Industrial Revolution, it became one of the biggest debtor nations; from its envied status as one of the wealthiest nations, it became a land synonymous with poverty; and from a nation with a large number of prestigious centers of higher education that attracted the cream of foreign students from Asia, it became the land with the highest number of illiterate persons. This remains a major untold story. The West has failed to recognize that its position of power was gained not by its inherent superiority but by the fact that it was successful in trampling over others. The justification for this gross exploitation and denigration of colonial victims was known as the civilizing mission. The colonial powers argued that in exchange for the wealth they plundered, both material and intellectual, they were providing the colonized people an opportunity to �modernize'. But, first, they had to create the perception that the West held all the keys to progress and that it was benevolently willing to share its gifts with the world. This perception was manufactured by Eurocentric historiographies and the manipulation, distortion, and concealing of historical data. In the Indian context, colonial Indologists were required to create a portrayal of India as a region that was backward and in need of colonial stewardship. After independence, many Indian intellectuals continued to use the pre-colonial, feudalistic framework of Indian society. In contrast, Arab scholars have brought out the important role of Islamic empires in the transmission of ideas into Europe. However, many discoveries and innovations of India, as acknowledged by the Arab translators themselves, are now often depicted as being of Arab origin, when in fact, the Arabs often retransmitted what they had learnt from India over to Europe. In the case of China, Joseph Needham, a leading scholar at Cambridge, made it his life's work to document China's history of science and technology in over 30 volumes. By the time he died at age 90, his works had transformed the study of China forever. The Needham Foundation has continued this monumental work, and has been expanding the series with new volumes. Today, every research library on China, and every major library on science and history, has the Needham collection as important reference. Every serious China scholar respects this work, and its impact on the perception of China has been phenomenal. This impact has also trickled down to depictions in schools and the general media. To elaborate on the colonial destruction of Indian industry, a subsequent chapter, �Colonial Destruction of India's Textile Industry�, gives a detailed account of a major instance of this colonial sabotage. We leave it to the reader to infer the fate of India's other major industries. India was world negating in its outlook, frozen in time and unable to advance without help from foreign invaders. India's civilization was mainly imported via invaders, except for its problems such as caste that were its own 'essences'. Indian society was socially backward (to the point of being seen as lacking in morality), hence dependent upon Westernization to reform its current problems. This should lead to the following introspection: Is India a 'developing' society, or is it a 'redeveloping' society? Were Indians always poor, always living in polluted and socially problematic conditions, and are these problems Indian essences? Or is there a history behind its present sociopolitical adversities? This history should not, however, excuse the failures of 50 years of independence to deal with the economic and social problems that persist. Indians need to overhaul their own assessment of their potential. Is India meant to be a nation dependent on importing technology and intellectual property, as we have been told for so long? Or is India meant to be a nation of exporters of technology and intellectual property, as Infinity Foundation believes? Should India upgrade its higher education in order to compete globally as an intellectual place of learning, competing with the West's best universities for the multi-billion dollar education industry? This would be a return to India's role in classical times, when its viharas (intellectual hubs) such as Nalanda and Taxashila attracted the cream of Asia's scholars much like Ivy League institutions in the United States do now. Or should India continue to depend on Western higher education for its paradigms, frameworks, research and development, certification of competence and credibility, careers and legitimacy for its brightest youth? China has embarked on a massive upgrade of its universities in order to export higher education to the third world. Its strategy is not driven by short-term economic income but by a long-term ambition to counter the West by spreading its own influence to the next generation of thinkers worldwide. These bold moves cannot come out of inferiority complexes, such as those that plague many educated Indians today. Until the 1800s, traditional knowledge generated large-scale economic productivity for Indians. It was the thriving Indian economy that attracted so many waves of invaders, culminating with the British. Traditionally, India was one of the richest regions in the world, and most Indians were neither 'backward' nor uneducated or poor. Some historians have recently begun to demonstrate that it was economic drainage, oppression, social re-engineering at the hands of colonizers that made millions of 'new poor' over the past few centuries. This explanation yields a radically different reading of the poverty in India today. Upon acknowledging India's traditional knowledge systems, one is forced to discard accounts of its history that essentialize its poverty and related social evils. Contemporary India's outsourcing industries and its ability to attract investments also depend on unstated, and often unconscious, impressions about India as a place to do business and about Indian culture. Since India sees itself as a global power, or at least a regional power, it must also embark on intellectually repositioning its brand � away from being seen as the center of human rights abuses, naked sadhus, exotica and erotica. There is no better place to start than via its long track record in science and technology. If learning the colonizer's language and customs were the cause for Indians becoming scientific minded, then why are most African, Latin American and many other third world former European colonies not able to develop as fast as India has done? The fact is China's and India's development should be seen not as development but as re-development, meaning that these civilizations' very fabrics have a culture of advancement through rational thought for millennia, and they are now reviving their innate capabilities that had become dormant and/or suppressed. Al-Beruni and other visitors recorded centuries ago that Indians were among the leading medical practitioners, researchers and educators in the Middle East. Records in China support these claims. Indians pioneered in various fields of mathematics, metallurgy, agriculture, medicine, shipping and trade, language. India was the mother of pan-Asian civilizations in certain ways just as Greece was the mother of European civilization. This Indian influence on East and Southeast Asia is acknowledged by those societies today and is well-documented in their own writings, but not in the writings by European writers where Indian sources are often marginalized. Indian Americans have additional factors to consider. Every new immigrant group in the US has had to define itself in the eyes of the American public though a process of education about its history, culture, values and special strengths. Americans are a very open-minded and fair people in judging newcomers, but the burden is on the newcomers to self-represent. This is not something one may reasonably abandon to others to do on one's behalf. The Indian American identity is now being negotiated in the US and Indians must be proactive. The capital required for universal Western-style development simply does not exist in the world, and the trickle down effect of free markets is too slow to reach the bottom tiers where most people live. Western civilization depends upon inequality (in the form of cheap labor) and massive natural resources, which is eventually unsustainable sociologically or ecologically. The global capitalist system in some ways stands in contradiction to individual rights, which it promotes in theory. For instance, a free market of labor would involve free movement of workers across international borders, but this would threaten the artificially high wages of Western citizens. The bulk of labor in the non-Western world is outside the framework of globalization and development. Significantly, today less than 10 per cent of India's labor works in the 'organized sector', namely as employees of a company. The remaining 90 per cent comprises freelances, contract laborers, private entrepreneurs, and so on. Many of them still practice traditional, non-Westernized trades. Indian colonial law continues to render much of their work illegal, making them highly vulnerable to exploitation, corruption, and abuse. The descendants of India's traditional knowledge workers, who built massive cities, who had highly developed and researched technologies, and who dominated world trade for centuries, are today de-legitimized in their own country. Many of today's poor jatis, such as workers in textile, masonry and metal works, were at one time the empowered guilds that supplied the world with highly-prized manufacture. The Western economic development model demands relentless growth to sustain equity valuations in the financial markets, and yet growth cannot be indefinite once population stabilizes. A steady state economy in zero-growth equilibrium would devastate the wealth of the West, since all financial valuations are predicated on growth. Thus, there is a vested interest for the West to push its technologies without looking to the extended future. Even if the world's six billion persons (anticipated to grow to ten billion by the middle of this century) were to magically achieve Western lifestyles, this would be temporary because of limits to the planet's natural resources. When Gandhi was asked whether he would like India to develop a lifestyle similar to England's, his reply may be paraphrased as follows: The British had to plunder the Earth to achieve their lifestyle. Given India's much larger population, it would require the plunder of many planets to achieve the same. The West controls the institutions, standards, socio-economic categories and laws (such as the notions of 'property' and 'justice' which originated from Biblical concepts) on which the global system is based. The non-West is thus inherently disadvantaged. The West will be able to accommodate a relatively small percentage of non-Westerners as honorary Westerners, to serve as middlemen in managing and containing the non-Western masses, in exchange for enjoying Western privileges. Western lifestyle is built on inequality. Cheap labor, cheap natural resources, and blights like industrial pollution and environmental degradation must be exported to the third world facilitate this lifestyle. For Western lifestyle to exist, poverty and deprivation must also exist somewhere in the world. Many in the West show awareness and concern for the �Other' but are unable to identify these problems as natural implications of Western lifestyle. Water is one of the more serious problem areas of India and many other parts of the world. There was an ancient Indian system of talabs (water tanks) in every village. They were designed to collect and store rainwater for irrigation and for drinking. It was a function of the village panchayat to maintain and administer these water tanks. However, under colonial rule, village governance was subverted or abandoned, since the goal was to maximize tax collection through a network of British-appointed �district collectors�. As native social structures were abandoned, many talabs went into disuse or misuse. Today, satellite pictures show only traces of what was once a massive network of man-made lakes. This indigenous system scores over modern dams that are centrally managed and possible ecological hazards. In parts of Tamil Nadu and Rajasthan, many of these old talabs have been excavated and revived, alleviating, to a degree, water scarcity. Indians were the first to develop steel, and the famous Delhi Iron Pillar is the world's oldest extant rust-free sample of steel, having lasted 16 centuries. Leading metallurgists are now engaged in research to understand the old processes and their implications for developing corrosion-resistant iron for specific applications like concrete reinforcement bars. Many healing systems from non-Western sources, including Indian medical systems, are now being revived. These complement modern medicine. Besides physical healing systems, such as Ayurveda, there is growing interest in Indian systems of mind-management, including forms of yoga and meditation. These have been incorporated in the West in the form of stress management or motivational training. Less than five per cent of the known classical Indian texts (in Sanskrit, Tamil, etc.) have ever been translated. What might be the insights and knowledge systems of our ancestors that lie hidden in these? It is, therefore, imperative that we study, preserve, and revive traditional knowledge systems. India's scientific heritage needs to be highlighted so as to replace Eurocentric historiography with an honest history of ideas. The depth and breadth of Indian science and technology is staggering, and this section gives just a glimpse into the genius of India's scientists and engineers. From complex Harappan towns to Delhi's Qutub Minar, India's indigenous technologies were very sophisticated. They included the design and planning of water supply, traffic flow, natural air conditioning, complex stone work, and construction engineering. Most students learn about the ancient cities of the Middle East and China. How many have even a basic understanding of the world's oldest and most advanced civilization � the Harappan or Indus-Sarasvati Valley Civilization in India? The Indus-Sarasvati Civilization was the world's first to build planned towns with underground drainage, civil sanitation n, hydraulic engineering, and air-cooling architecture. While the other ancient civilizations of the world were small towns with one central complex, this civilization had the distinction of being spread across many towns, covering a region about half the size of Europe. Weights and linguistic symbols were standardized across this vast geography, for a period of over 1,000 years, from around 3,000 BCE to 1500 BCE. Oven-baked bricks were invented in India in approximately 4,000 BCE. Over 900 of the 1,500 known settlement sites discovered so far are in India. Since the Indus-Sarasvati script is yet to be decoded, it remains a mystery as to how these people could have achieved such high levels of sophistication and uniformity in a dispersed complex and with no visible signs of centralized power. Given the importance of fresh water in India, it is no surprise that the technologies to manage water resources were highly advanced from Harappan times onwards. For example, in Gujarat, Chandragupta built the Sudarshan Lake in late 4th century BCE, and was later repaired in 150 BCE by his grandson. Bhopal's Raja Bhoj Lake, built in 1014-1053, is so massive that it shows up in satellite images. The Vijayanagar Empire built such a large lake in 14th � 15th century CE that it has more construction material than the Great Wall of China. What some historians call the �Persian Wheel� is actually pre-Mughal and indigenous to India. Scientists estimate there were 1.3 million man-made water lakes and ponds across India, some as large as 250 square miles. These are now being rediscovered using satellite imagery. These enabled rain water to be harvested and used for irrigation, drinking, etc. till the following year's rainfall. Indian textiles have been legendary since ancient times. The Greeks and Romans extensively imported textiles from India. Roman archives record official complaints about massive cash drainage due to these imports from India. One of the earliest industries relocated from India to Britain was textiles and it became the first major success of the Industrial Revolution, with Britain replacing India as the world's leading textile exporter. What is suppressed in the discourse about India and Europe is the fact that the technology, designs and even raw cotton were initially imported from India while, in parallel, India's indigenous textile mills were outlawed by the British. India's textile manufacturers were de-licensed, even tortured in some cases, over-taxed and regulated, to 'civilize' them into virtual extinction. Textiles and steel were the mainstays of the British Industrial Revolution. Both had their origins in India. The Ahmedabad textile museum is a great resource for scholarly material. Iron is found in countries neighboring India, leading European scholars to assume that it came from outside India. Given the similarities between the Vedas and Avesta (a Zoroastrian text), some saw this as supporting the theory of diffusion of iron and Vedas into India from the outside. Refuting this, Vibha Tripathi finds that iron in India is much older. (See details in a subsequent chapter.) Cemeteries in present-day Baluchistan have iron objects. The earlier iron found in Middle Eastern archeological sites was essentially meteorite material sculptured as rock/stone carvings, and was not metallurgically processed at all. Since iron can be a by-product of copper technology, this could be its likely origin in India because copper was a well-known technology in many parts of ancient India. A smelting furnace dated 800 BCE is found in Naikund (Maharashtra), India. Recent discoveries reveal that iron was known in the Ganga valley in mid second millennium BCE. In the mid-first millennium BCE, the Indian wootz steel was very popular in Persian courts for making swords. Indian industry was dealt a death blow by the colonial masters who banned the production and manufacture of iron and steel at several places in India, fearing their use in making swords and other arms. In addition, they also ensured India would depend upon iron and steel imported from Europe. Another important Indian contribution to metallurgy was in the isolation, distillation and use of zinc. From natural sources, zinc content in alloys such as brass can go no higher than 28 per cent. These primitive alloys with less than 28 per cent zinc were prevalent in many parts of the world before India. However, to increase the zinc content beyond this threshold, one must first separate the zinc into 100 per cent pure form and then mix the pure zinc back into an alloy. A major breakthrough in the history of metallurgy was India's discovery of zinc distillation whereby the metal was vaporized and then condensed back into pure metal. Brass in Taxashila has been dated from third century BCE to fifth century CE. A vase from Taxashila is of particular interest because of its 34.34 per cent zinc content and has been dated to the third century BCE (Marshall 1951: 567-568). Recently two brass bangles belonging to the Kushana period have been discovered from Senuwar (Uttar Pradesh, India). They are also made of metallic zinc as they have 35 per cent zinc content (Singh 2004: 594). Experts are unsure if this zinc was made by distillation process. There is evidence of zinc ore mining at Zawar in Rajasthan from the fifth century BCE, but unfortunately there is lack of evidence of regular production of metallic zinc until the eighth century CE. The earliest confirmed evidence of zinc smelting by distillation is dated back to 840 +110 from Zawar (Craddock et al. 1985, 1989). This is the earliest date for zinc smelting and production of metallic zinc by distillation process anywhere in the world. Europeans learnt it for the first time in 1743, when know-how was transferred from India. Until then, India had been exporting pure zinc for centuries on an industrial scale. At archeological sites in Rajasthan, retorts used for the distillation are found in very large numbers even today. Once zinc had become separated into a pure metal, alloys could be made with the required zinc component to provide the required properties. For instance, strength and durability increase with higher zinc component. Also, copper alloys look like gold when the zinc component is higher than 28 per cent. Most early brass objects found in other countries had less than 10 per cent zinc component, and, therefore, these were not based on zinc distillation technology. Three important items are now proven about the history of zinc metallurgy: (i) zinc distillation and metallurgical usage was pioneered in India; (ii) industrial scale production was pioneered in Rajasthan; (iii) England transferred the technology of zinc from India in 1736. British metallurgy documents do not mention zinc at all prior to this transfer. Shipbuilding was one of India's major export industries until the British dismantled it and formally banned it. Medieval Arab sailors purchased their boats in India. The Portuguese also continued to get their boats from India and not Europe. Some of the world's largest and most sophisticated ships were built in India and China. The compass and other navigation tools were already in use in the Indian Ocean long before Europe. (�Nav� is the Sanskrit word for boat, and is the root word in �navigation� and �navy�.) Using their expertise in the science of seafaring, Indians participated in the earliest-known ocean-based trading system. Few people know that an Indian naval pilot, named Kanha, was hired by Vasco da Gama to captain his ships and take him to India. Some of Europe's acclaimed �discoveries� in navigation were in fact appropriations of a well-established thriving trade system in the Indian Ocean. Contrary to European portrayals that Indians knew only coastal navigation, deep-sea shipping had existed in India as Indian ships had been sailing to islands such as the Andamans, Lakshdweep and Maldives around 2,000 years ago. Kautilya describes the times that are good and bad for seafaring. There is also extensive archival material on the Indian Ocean trade in Greek, Roman, and Southeast Asian sources. Many interesting findings have recently come out about the way forests and trees were managed by each village and how a careful method was applied to harvest medicines, firewood and building material in accordance with natural renewal rates. There is now a database being built of 'sacred groves' across India. Once again, it's a story of an economic asset falling into disuse and abuse because of the dismantling of local governance and disrespect for traditional systems. Furthermore, when scholars try to explain India's current ecological disasters, they seldom mention the large-scale logging of Indian timber by the British in order to fund the two world wars and various other industrial programs of the empire. Indian farmers developed non-chemical, eco-friendly pesticides and fertilizers that have modern applications. These traditional pesticides have been recently revived in India with excellent results, replacing Union Carbide's products in certain markets. Crop rotation and soil technology that has been passed down for thousands of years are traditional practices which India pioneered. Historically, India's agricultural production was large and sustained a huge population compared to other parts of the world. Surpluses were stored for use in a drought year. But the British turned this industry into a cash cow, exporting very large amounts of grain even during food shortages. This caused tens of millions of Indians to die of starvation in the 19th century. Much re-legitimizing of traditional Indian medicine has already started, thanks in part to many Western labs and scientists. Many multinationals no longer denigrate traditional medicine and have in fact been trying to secure patents on Indian medicine without acknowledging the source. Traditional medicine is now a well-known and respected field. The first math war in Europe was from 10th to 16th centuries, during which time it took Europe 500 years to accept the zero, because the Church considered it to be heresy. The second math war was over the Indian concept of indivisibles, which led to the theory of real numbers and infinitesimals, paving the way for the development of calculus. This war lasted three centuries, from the 17th to 19th centuries. The third math war is now under way and is between computational math (Indian algorithmic approach) and formal math (Western approach). Additionally, Indians developed many important concepts including the base-ten decimal system, now in global use, and crucial trigonometry and algebra formulae. They made several astronomical discoveries. Diverse schools of logic and philosophy proliferated. Mathematical thought was intertwined with linguistics. India's Panini is acknowledged as the founder of linguistics, and his Sanskrit grammar is still the most complete and sophisticated of any language in the world. Besides the above examples of Indian contributions to the origins of the so-called �Western� science, there is another category of traditional knowledge called non-literate folk science. Western science as a whole has condemned and ignored anything that it did not either appropriate or develop, by branding it as magic and superstition. However, in countries such as India, which boast of cultural continuity, ancient traditions survive with a rich legacy of folk science. In North America and Australia, where original populations have been largely decimated, such continuity of folk tradition was disrupted. In Western nations with large colonies in the Old and New Worlds, such knowledge systems were looked down upon once they had been successfully plundered. The process of contrasting Western science with folk knowledge systems has led to the imposition of contrived hegemonic categories. The distinction between elite and folk science was non-existent in ancient times. India's advanced metallurgy and civil engineering was researched and practiced by artisan guilds. Western science seldom realized that non-literate folk science preserves the wisdom gained through millennia of experience and direct observation, and has been transmitted by word of mouth. For instance, modern scientists have humbly admitted that the ecological management practiced today by the tribes of India's Northeast is far superior to anything they could teach them. A good example is the use of alder (Alnus nepalensis), which has been cultivated in the jhum (shifting cultivation) fields by the Khonoma farmers in Nagaland for centuries. It has multiple usages for the farmers, since it is a nitrogen-fixing tree and helps to retain the soil fertility. Its leaves are used as fodder and fertilizer, and it is also utilized as timber. One could cite numerous such examples. The vast majority of modern medicines patented by Western pharmaceutical firms are based on tropical plants. The most common method to select candidates for detailed testing has been for Western firms to scout tropical societies, seek out established �folk� remedies and subject these to testing by �Western science�. In many cases, patents owned by multinationals are largely for isolating the active ingredients in a lab and going through rigorous protocols of testing and patent filing. While this is an important and expensive task that deserves credit, these are seldom truly independent discoveries from scratch. Never has the society that has discovered them through centuries of empirical trial and error received any recognition, much less any share of royalty. Colin Scott writes: "With the upsurge of multidisciplinary interest in 'traditional ecological knowledge', models explicitly held by indigenous people in areas as diverse as forestry, fisheries, and physical geography are being paid increasing attention by Western scientists, who have in some cases established extremely productive long-term dialogues with local experts. The idea that local experts are often better informed than their Western peers is at last receiving significant acknowledgment beyond the boundaries of anthropology." Myths and legends sometimes represent the attempts of our ancestors to explain the scientific observations they made about the world around them and transmitted these to the future. They chose different models to interpret the observations, but the observations were empirical. Theorizing the possible role of myths, Scott writes: "The complementarity of the literal and the figurative helps us to realize that the distinction between myth and science is not structural, but procedural ... Myths in a broader, paradigmatic sense are condensed expressions of root metaphors that reflect the genius of particular knowledge traditions ... Numerous studies have found that the "anthropomorphic" paradigms of egalitarian hunters and horticulturalists not only generate practical knowledge consistent with the insights of scientific ecology, but simultaneously cultivate an ethic of environmental responsibility that for western societies has proven elusive." Despite these acknowledgments, in too many cases Western scholars reduce India's experts to �native informants� who are seen located below the glass ceiling: the pandit as native informant to the Western Sanskritist; the poor woman in Rajasthan as native informant to the Western feminist seeking to cure her of her native tradition; the herbal farmer as native informant to the Western pharmaceutical firm appropriating medicines for patents. Given their poverty in modern times, these 'native informants' dish out whatever the Western scholar expects to hear in order to fit his/her thesis, because in return they receive rewards. Rarely have Western scholars acknowledged India's knowledge bearers as equal partners. The obsession to make 'original' discoveries and to put one's name on publications has exacerbated the tendency to appropriate with one hand, while denigrating the source with other hand. This deserves to be called 'academic arson'. India's inner sciences of mind and consciousness are simultaneously (a) being appropriated by the West and (b) being depicted as anti-progressive and irrational. In fact, inner and outer realms of inquiry are often viewed as opposites that can, at best, be balanced but not unified. This falsely assumes that the inner sciences make a person and society less productive, creative, and competitive in the outer realm. However, contradicting this, India's inner sciences and outer development coexisted in a mutually symbiotic relationship. A strong inner science will definitely strengthen the outer science since it is the inner world which provides the inspiration, creativity, and knowledge that is necessary in the development of a sound outer science. A strong outer science allows the freedom for the exploration of the inner science. Without the use of technology of some form, man will be forced to dwell in his lower nature to satisfy his basic needs of survival. The divorce of �religion' and science is a strictly Western construct due to the dogmatic and rigid nature of the Abrahamic religions. History-centric religions (such as Judaism, Christianity, and Islam) are often not compatible with the human tendency towards freedom of thought, intellectual originality, and non-conformity of thought which are necessary in scientific innovation. The tradition of spiritual experimentation in India, however, is compatible with the material and intellectual experimentation required by science. An exploration free from the phobias against Indian Civilization would show that the West did not come out on top due to any inherent superiority, as claimed by Hegel and others, but, rather, due to their cunning and ruthlessness. This kind of research will establish that non-Western minds not only have the ability to contribute to original technology, but, in fact, have been instrumental in its development. India's own English-educated elite should be made aware of these facts to shed its Macaulayite complexes. Since colonial Indology and world history have become institutionalized over many decades, many of the reference works and popularly used texts are in drastic need of being rewritten. The availability of new reference works for scholars would alter the historical assessment of India. However, it is obvious that the current institutions controlling the intellectual discourse do not desire to alter the power equation. Therefore, the Infinity Foundation has stepped up to meet this challenge. 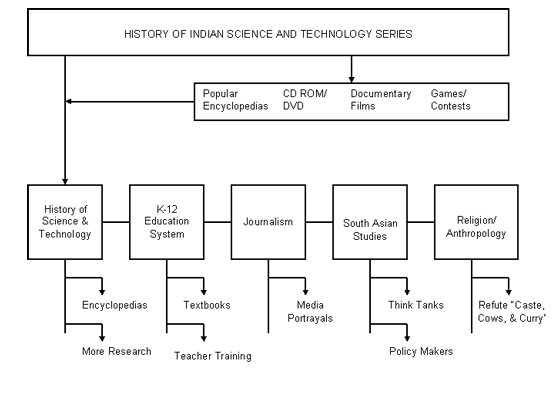 There is extensive documentation of Indian contributions to the world in science and technology, but this is largely scattered and disorganized. The purpose of Infinity's project is to amalgamate this mass of information into one definitive book series, just as Prof. Needham did for China. Each proposed volume is estimated to be completed in three years from the time of commission. Each volume has its own schedule and timetable, depending on the particular subject. Some volumes require more original research, even field data gathering, while others are mainly a matter of library research � to identify, compile and validate pre-existing academic works, categorizing them according to modern standards. The government of India started a multi-volume project many years ago, but it has focused mainly on philosophy and not on practical science or technology. Furthermore, being government-driven, it is not market-oriented in its packaging or distribution. It is seldom referenced by textbook authors and is rarely found in libraries. Some writers have tended to exaggerate claims of Indian scientific accomplishments by wildly interpreting statements written in classical texts. Based on such textual references for which there is no physical evidence, they have concluded that there was space travel in the Mahabharata, along with nuclear weapons and just about every modern hi-tech item. This has justifiably earned them the term �chauvinists,� and the entire activity of writing about Indian science has become discredited. Infinity Foundation considers it very important to distance itself from such discredited scholarship. This is why our book series is being built on solid academic scholarship only, and not on lofty extrapolations. Researching unsubstantiated claims about old knowledge does have its place, but facts must be separated from unproven hypotheses. Therefore, this project does not include Puranas as scientific sources. Our project involves rigorous peer reviews of each manuscript. Inexpensive editions that could be donated to libraries in developing societies. Documentaries based on the books. Eventually CD-ROM/DVD with pictures and music. There must be new editions every few years to keep the volumes current and expanding. To achieve this, the project would like to become financially self-sufficient so that revenues are used to continue the work indefinitely. New titles, regular conferences and other activities should keep this series fresh in the minds of educators. Some critics have claimed that this series is anti-Western. Our response is that it is in everyone's best interest to have a truly global education system in which all cultures' contributions and merits are celebrated. This necessitates demolishing false notions of history promulgated by the colonizers. Others who are deeply brainwashed in India phobia might find it convenient to dismiss this book series as �Hindutva�, �right-wing fundamentalist�, and so forth. This is completely baseless since Indian science is not about any particular religion. It is the heritage of every Indian, regardless of faith or lack thereof. Just as Newtonian laws are not Christian and Einstein's relativity theory is not a Jewish science, so also the scientific discoveries of Indians are independent of their faiths. The importance of this work may be compared to Europe's use of classical Greek thought to raise itself out of the Dark Ages. India should also look to its own rich tradition of knowledge to move forward and complement modern knowledge.